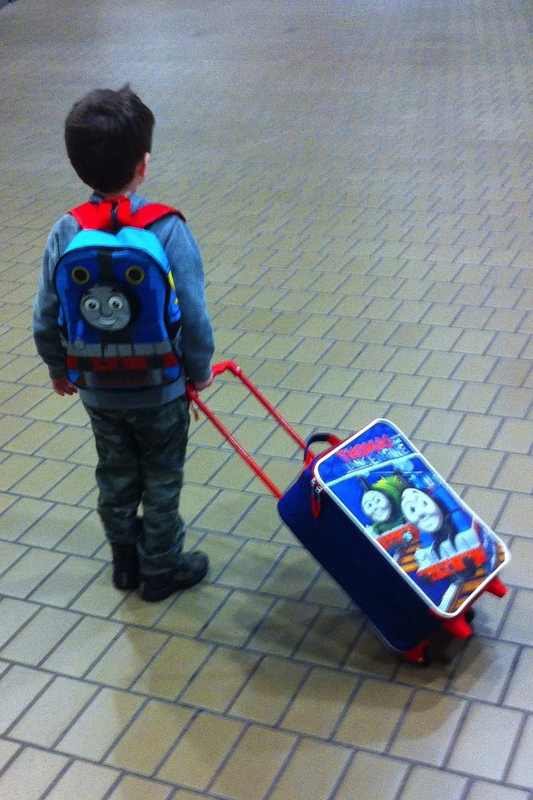 “But, Mommy, I need it!” No, sweetie, you don’t need another Thomas train. The fifteen you have plus the hundred non-Thomas trains cluttering our house are more than sufficient. Yes, my 4 year old seems to be deeply embedded in a materialistic phase of life. It’s hard to blame him. Those Thomas folks are marketing geniuses. 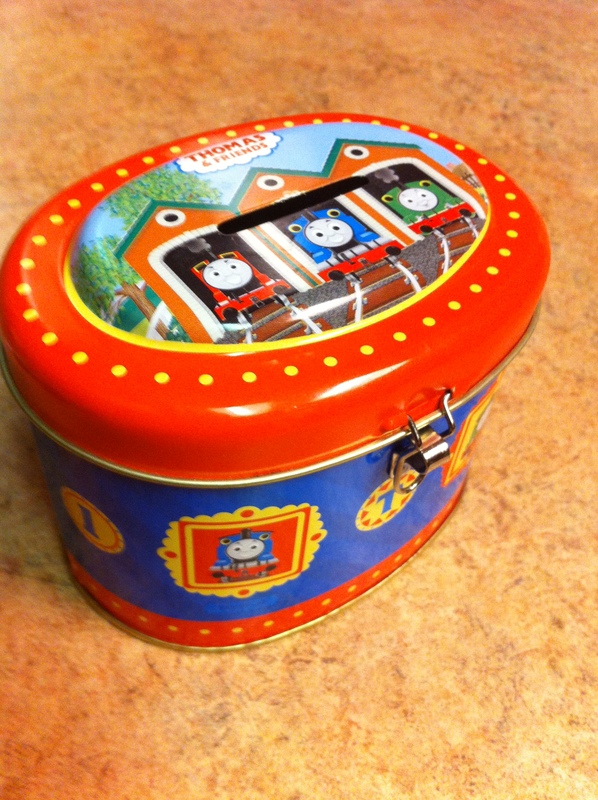 Every time you buy a Thomas product there is a colorful wish list inside for your child to drool over the trains he doesn’t yet have. There are wood trains, metal trains, and plastic trains. There are wood tracks and plastic tracks. There are books, lunch boxes, Easter baskets, blankets, and pillow pets. Every time a new video comes out it features new trains that “need” to be added to his collection. What’s a four year old to do? I don’t blame him, but I do want to “train him up in the way he should go”. I want him to understand the difference between needs and wants. I want him to grasp that money doesn’t grow on trees. I want him to learn the value of hard work. I want him to understand he has control over his purchases, not the mighty marketing machine. 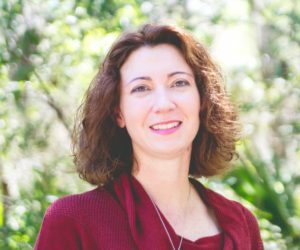 In Financial Peace University, Dave Ramsey’s daughter, Rachel Cruze, discusses using a commission system for kids to teach them the value of work and how to handle money. It entails paying your child a commission for doing chores. If they work they get paid, if they don’t work they don’t get paid. It also entails helping your child budget his or her money by dividing it into three categories – give, save, and spend. What types of chores, how much they get paid, and how often they get paid depends on the child’s age and the family’s preferences. We started Little Man on a commission system last April when he was still three. Since he is so young, we keep it as simple as possible. He earns quarters by taking his dishes to the sink and picking up toys. In the beginning, he had no clue he could buy things with quarters, but he was still excited when he earned them. He liked them because they were shiny. And I think they reminded him of gold doubloons (Thanks Jake and the Neverland Pirates. Don’t even get me started on Disney’s marketing prowess). Every time he gets 10 quarters in his bank, we count and “budget” them. The first quarter goes into his “Give” envelope to teach tithing. The next two quarters go into his “Save” envelope. The remaining seven quarters are for his “Spend” envelope. When the “Spend” envelope gets weighted down with quarters, he helps me stack the quarters in groups of four to exchange for one-dollar bills. The math lessons are a great bonus. We made a big deal out of it the first time he got to spend his quarters at a frozen yogurt shop. We invited his grandmother to join us for the historic occasion. We took pictures and video. We talked with him about how he was going to spend HIS hard earned money to buy his frozen yogurt. Isn’t that exciting, Little Man? I had him stand at the counter and help me count out his quarters for the $3 purchase. Let me re-phrase, I tried to have him help me. We’ve had several teaching moments since we started the commission system. One day at Wal-Mart standing in the toy aisle, I showed Little Man the trains that were within his spending limit (the money in his envelope). He picked Percy – Thomas’ best friend. We continued on with Mommy’s shopping. Things came to an abrupt halt when we reached the book aisle. There was a Thomas book! Not just any Thomas book, the Thomas book that had a map of the Island of Sodor and tiny trains to “run” along the tracks on the map. He recognized it right way because he already had this book, but most of the tiny trains had been lost – one in the Atlantic Ocean, but that’s another story. Oh, how he wanted that book to replenish the tiny trains. It just so happened to cost about the same amount as the Percy in his hand. After a difficult conversation about making choices and almost having to “borrow” a tent to camp out while he weighed his options, he confidently laid down the Percy and picked up the book. Decision made. He never looked back. Mommy was proud. Don’t get me wrong, commissions haven’t turned him into a little angel when it comes to working and spending and wanting and needing. It’s a process. Some days, it’s a nightmare to get him to do his chores; some days he’s a rock star. But he is progressively getting better. Things have been a little tougher since receiving an abundance of gifts for Christmas and his birthday. We had a tough discussion about how his birthday was over so he wouldn’t be getting gifts all the time; he had to go back to earning quarters to buy things he wants. I didn’t think it had really sunk in until one day he was watching the Sprout channel. Sprout makes a big deal about birthdays and when a host said we want to celebrate your birthday with you, Little Man yelled at the TV screen, “No, it’s not my birthday, my mommy said it was over!” Oops, maybe that discussion was just a little too tough. Some days, I still hear “I need, I need, I need” all the way through a shopping trip. But saying “sorry, you don’t have enough quarters to pay for that today, would you like to earn some more when we get home?” certainly helps get through those tough days. Eric and I look forward to seeing his growth in understanding money matters in the years to come. While the giving and saving portions of his budget are still a bit of mystery to him at this point, we love that they will always be a part of his life. We pray when he is older, he will not depart from our training. Do you use a commission system with your child(ren)? How is it working? Not using it, but want to? As long as your child is still living in your home, it’s never too late to start. What other techniques do you use to teach your child(ren) money lessons? I do it a bit differently, but with the same end in mind. Certain jobs around the house get no payment at all; some things are just what need to be done because you’re a part of the family & things need to be done. I pay my kids for bigger jobs that are above & beyond their normal duties, lime car washing & waxing, throwing mulch, pressure cleaning, etc. Now that my kids are older at 10 & almost 12, they understand the value of money, they’re expected to pay for their “wants” above & beyond what they actually need. For example, my son needs sneakers for PE and school, but he doesn’t need $90 Nike Free Runs. So, if he wants shoes like that, I will generally buy 1 shoe, because that’s the amount I budgeted to spend. It’s up to him to buy the other shoe & pay the taxes. It has also helped to make him aware of sales. & shopping around to get the best prices, too. For their charitable giving, every summer my kids are required to choose the name of a child in our area who is their age & gender, and must spend their own money to purchase a school uniform for that child. At Chritmas, they do the same thing, buying socks, underwear, sneakers & a small gift for a child of their age & gender on the Angel Tree. They’ve been doing that since 1st grade, and doing it for someone who could theoretically be in their class or scout troop or on their soccer team makes it very real. That’s awesome Kathleen! I agree kids shouldn’t be paid for every chore they do. Some are done because they are part of the family. Moms and Dads certainly don’t get paid for everything we do, do we? Parents need to make it clear which chores are “paid” and which are not. Love the partial payment for needs versus wants and finding ways to make giving real. Fortunately I have a little girl who LOVES to be a helper most days. We too have not done an allowance, because I feel that doing things around the house are part of being a family, and that it’s their responsibility rather than a job. Plus she is happy to be “paid” in M&M’s for now! 🙂 But I do want to start teaching her to give, save and spend. So I guess I just have to come up with a system that works. Love the little $ pouches. Where did you get them? 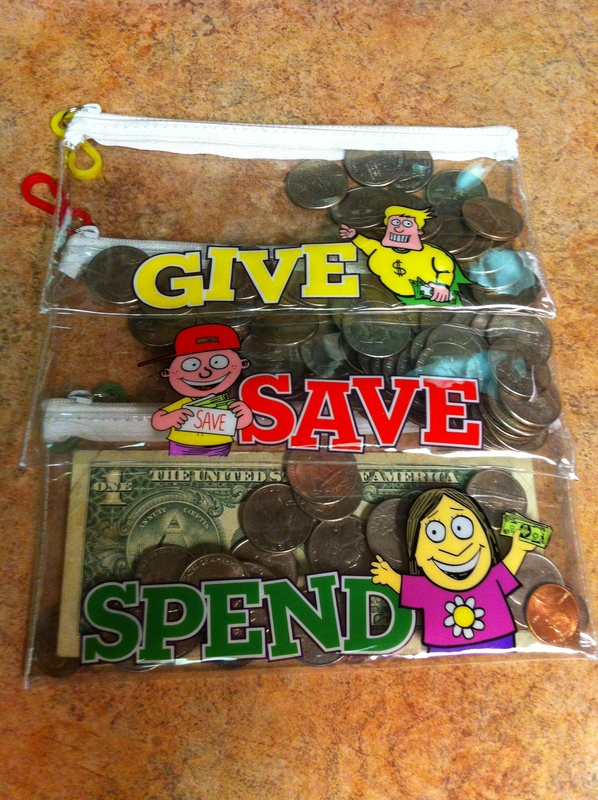 The pouches were part of Financial Peace Junior which can be ordered here..http://www.daveramsey.com/store/kids-teens/kids-3-12/financial-peace-jr-for-kids-ages-3-12/prod112.html. It also has a dry-erase chore chart, a workbook, and a few other goodies. For now, we just use the pouches. I love it because I can throw the spend envelope in my purse when we go to the store. The book I’m currently reviewing, Smart Money Smart Kids, goes into a lot of detail about how to teach your child about give, save, spend based on their age and personality. It also talks about finding the balance between paying commission for a few chores but doing most household tasks because you’re part of a family. You’ll see an option to pre-order the book if you go to the site for Financial Peace Junior. Help! What to Do with All This Extra Cash?